To be able to please yourself and your loved ones with tasty dishes as often as possible, cooking alone is not enough, it also requires knowledgeable kitchen equipment. And first of all, we are talking about the oven, because, as a rule, it is in it that real culinary masterpieces are created. The range of ovens on the market today is amazing and leads to confusion and confusion. 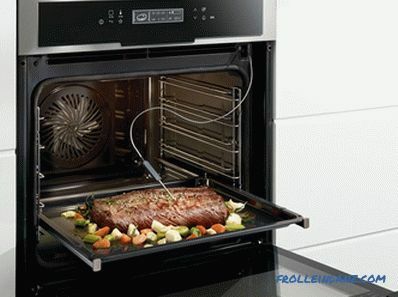 How to choose the built-in electric oven, not only to spend money, but to get a real helper in the kitchen? The task is difficult, but quite solvable. .. Most of the ovens produced today are independent household appliances. They have their own control system, and their work is in no way connected with the work of other kitchen units. For many users, this is a huge advantage, because such an oven can be placed anywhere in the kitchen (for example, in a closet column for built-in appliances) at the height that is most convenient for you. There is also an alternative option - the dependent oven. It is sold in a set with a hob and has a control panel with it placed on the front surface of the oven. If you initially plan to buy one and the other kitchen unit, then the purchase of such a kit is a real chance to save you, because it will cost you much cheaper than an oven and a hob, bought separately. In addition, the elements of the kit are usually made in the same style, which means that you will not have to keep in mind also the question of the compatibility of the equipment with each other in design. Some manufacturers leave the customer a choice, producing several models of cooking surfaces that are compatible with this model of the oven. On this, the merits of the dependent ovens end, then, alas, a whole series of minuses follow. First, the combined control panel often looks a little overloaded with control elements. Secondly, there are limitations to the placement of the oven: the cooking surface and the oven should be located in close proximity to each other, and since the first is always installed at a certain level, you can inevitably get access to the second only by bending over. The third and most significant disadvantage of the dependent sets is that if for some reason your oven breaks down, you are more likely to lose the use of the hob. There are several sizes of ovens. 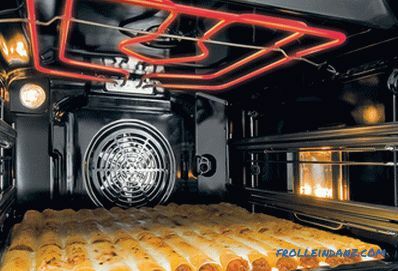 Both the width and height of a full-size (standard) oven are 60 cm. Compact with the same width slightly lower - 40-45 cm, and narrow, on the contrary, with a standard height have a smaller width - only 45 cm. Compact and especially narrow ovens - ideal option for small kitchens. 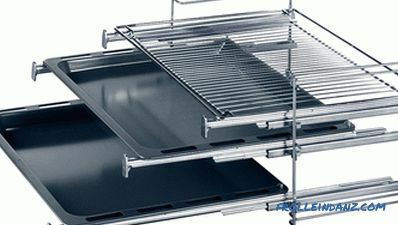 Available on the market and models increased to 90 cm wide, their height, like that of compact ovens, is 45 cm. The depth of all the above types of ovens is about the same - 55-60 cm, because this parameter is determined by the depth of the kitchen set, but here standard dictated by convenience. The answer to the question of which built-in electric oven is best to choose depends primarily on the size of the room you have. Most of our compatriots are still owners of incredibly tiny kitchens, where the struggle is for every free centimeter of space. And since such a kitchen wants to be equipped with all the necessary equipment, you have to sacrifice something, in this case - the size of the oven. However, this will not necessarily be a sacrifice: if you have a small family and, therefore, you cook a little, then there is simply no need to chase a large-volume model. We consider it necessary to warn you against one rather common mistake. 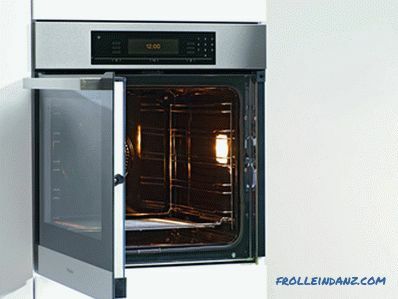 If, having read its mounting dimensions on the price tag of the model you like, you are happy to rub your hands at the thought that you can squeeze this oven into a niche reserved for it, hurry to disappoint you - this oven does not suit you, and you need to look for another option. The word "squeeze" for embedded technology is unacceptable. The oven is a powerful source of heat, which means that the furniture, which is in close contact with its walls, will also heat up. Regular overheating of the latter will inevitably be the cause of gradual destruction (it is not excluded that the worst outcome is a fire). Therefore, when embedding heating equipment into furniture, ventilation gaps between their walls should be provided. 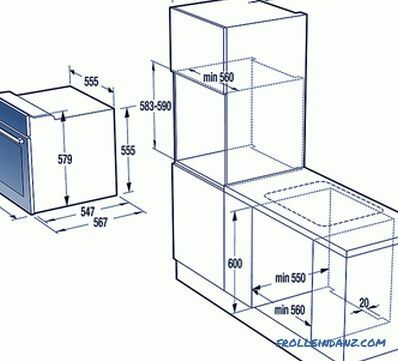 The distance between the oven and the side walls of the niche in which it will be embedded must be at least 5 mm on each side, and from the bottom of the oven to the “floor” of the niche - at least 85 mm. The back walls must be separated by at least 40 mm of free space (often the back wall of a niche is simply removed). The numbers above are some general guidelines. Different models may have their own installation features, and should focus primarily on the information contained in the instruction manual. Many people like to create various culinary masterpieces in ovens, almost everyone loves to absorb these freshly baked dishes, but no one is eager to launder the oven-spattered walls. Modern technologies can significantly facilitate this process, however, ovens, in which these technologies are implemented, are much more expensive. Oven with which cleaning method to choose and is it worth it to overpay for it? Low-cost models, the inner walls of which are covered with conventional heat-resistant enamel, suggest traditional cleaning - manually, using a sponge and detergent. It should be noted that if you don’t accumulate dirt for years, but do it regularly, after each cooking, it’s not so difficult. The catalytic purification method is implemented in most models of the middle price segment. The walls of the working chamber in such ovens (often not all, but only the back, as the most polluted) are coated with a special enamel containing a catalyst. The latter contributes to the splitting of fat into water and carbon; this occurs at elevated temperatures, directly during the cooking process. 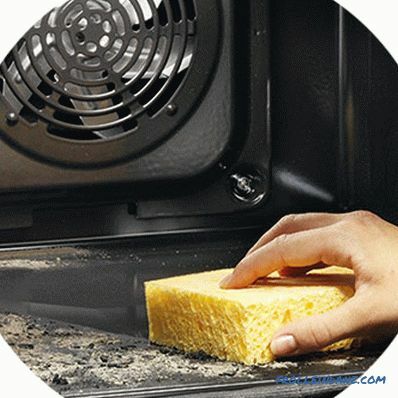 When the oven has cooled, it will remain to remove the soot accumulated as a result of the catalytic process with a damp sponge. The disadvantage of this method is to reduce the activity of the catalyst after 5-7 years of active operation of the oven. Premium models often use a more efficient pyrolytic cleaning method. 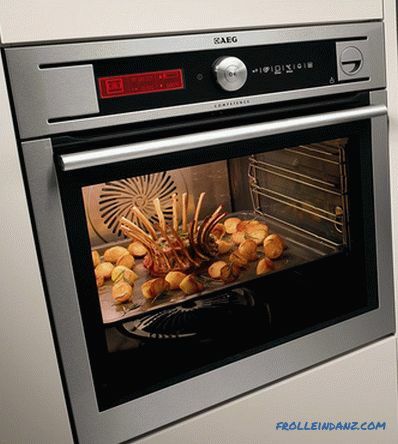 When activated, the oven warms up to 500 ° C, at such a high temperature, the fat simply burns. 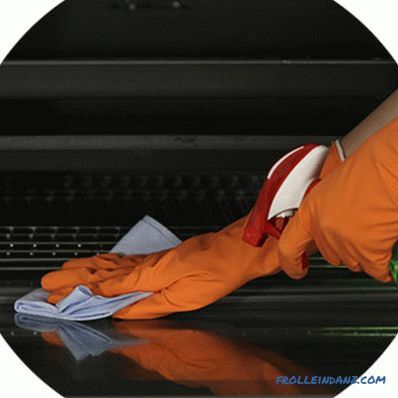 After this self-cleaning, it is enough to wipe the oven walls with a damp cloth or sponge to remove a small amount of the pyrolysis product - soot. 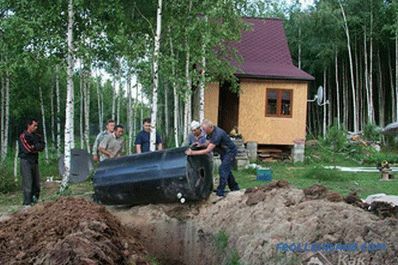 This method contributes to additional energy consumption, and the oven in which it is implemented, the most expensive, but despite this, pyrolysis is very popular among consumers. In recent years, another cleaning method has gained popularity - steam water. It is quite simple and economical, but it is quite effective. 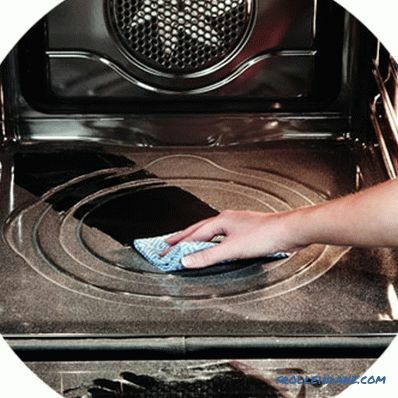 A baking tray with a small amount of water is set in the oven and the cleaning mode is activated. The vapor generated by the heating of the liquid softens the impurities on the walls of the working chamber, and they are easily removed by mechanical means. Even owners of the cheapest ovens can use this method, because to start the process of vaporization, it is not necessary to have a special button on the control panel - just warm up the working chamber to 70-90 ° C.
The convenience of using the oven is largely determined by the way it implements its control system. There are two possible options - electromechanical and electronic control. The presence of an electromechanical control unit significantly reduces the cost of the unit, but its main advantage is simplicity. 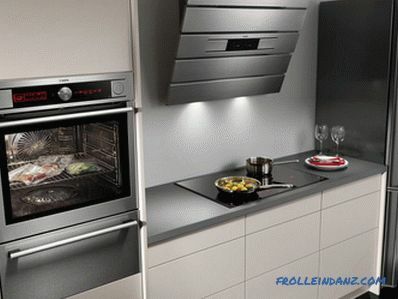 Even if you are not limited in funds, but you get equipment for some of your elderly relatives, when deciding which electric oven to choose - choose electromechanical control or electronic, preference should be given first: older people, as a rule, have difficulty communicating with modern electronics. The electromechanical control unit is represented by three usual all rotary switches: one is designed to set the temperature, the second - the timer - is needed to control the oven operation time, and the third selects the heating mode. Sometimes the rotary switches make the recessed into the device, but this does not make any fundamental changes in their functioning, but only simplifies the process of cleaning the panel from dirt. In electronically controlled ovens, all the necessary working parameters are set using the buttons or, more often, touch fields. Usually, electronic control provides for a special display that displays information about the selected mode, temperature, cooking time, etc. Today you can find models with rather large touch color displays.The latter do not simply display information about the operation of the oven, but visualize the process of the user's “communication” with it. The management of such technology resembles the management of modern digital gadgets - with “flipping through” the menu pages, selecting the necessary items by touching the corresponding icons on the display, etc. 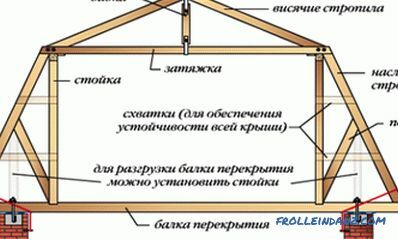 If you belong to the category of people who are ready for any expenses for the sake of owning the “advanced” with appliances, you can even search for the oven, which allows you to download various data via the USB port, including recipes and photographs of ready-made dishes - today there are some. The electronic control system not only expands the possibilities of the oven, allowing you to implement various automatic cycles, set the on or off time, more precisely control the time and temperature. It provides a different level of ease of use of household appliances. But in addition to high cost, electronics have another major drawback - the probability of its failure is much higher than that of electromechanics. 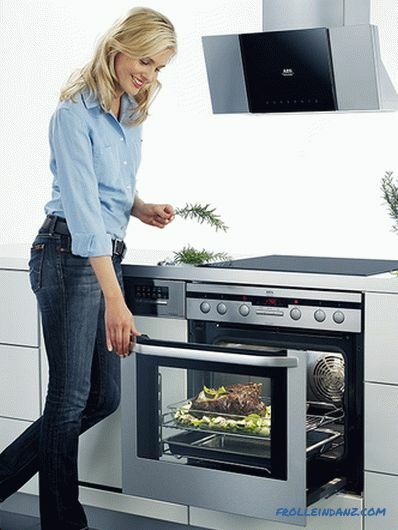 Most modern ovens are multifunctional devices. It depends on what your oven can do, how much you can realize your culinary potential. Preparation of different products requires different temperatures and different heating rates. From this it follows that the more heating modes the oven has, the more varied the list of dishes that you can cook in it, the more opportunities you have for various culinary experiments. Low cost electric ovens, as a rule, have upper, lower, and combined (upper + lower) heating, as well as grill mode. For more expensive models, convection modes are added to classic heating modes. On the back wall of such ovens there is a fan, around which a ring heating element is placed. The fan contributes to the rapid and uniform distribution of heated air throughout the working chamber. Ovens Electronically controlled cabinets often have a number of additional modes that significantly extend the functionality of the device. The presence of a convection fan allows for the mode of careful defrosting of products: the heating elements in this mode are not turned on, and the fan drives air at room temperature through the chamber. The programs "Quenching" and "Toming" are designed for slow cooking of products at relatively low temperatures, which contributes to maximum preservation of useful substances in them. 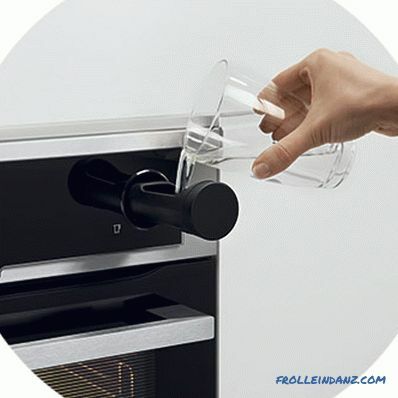 The “Fermentation” mode can be used for home cooking of yoghurt, raising yeast dough, etc. 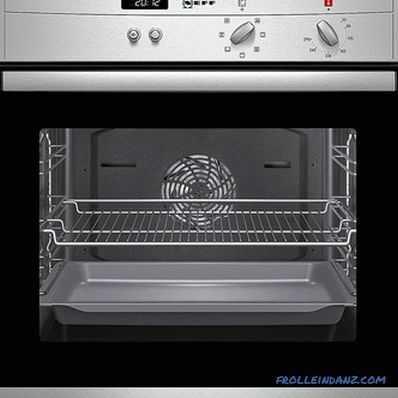 Some modern oven models have a steam treatment mode. In most cases, this is not steam cooking, but a symbiosis of steam and heat treatment of products. However, commercially available oven with a special design of the steam generator - such can be used as a classic double boiler. 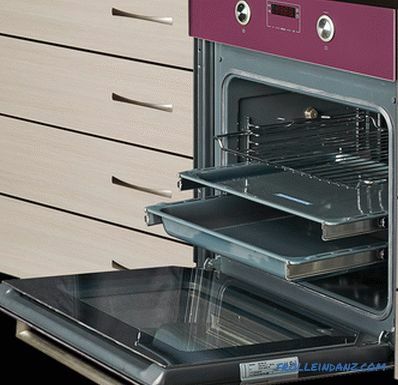 The electric oven can be equipped with an integrated microwave module. As a result, you get two appliances in one, which can be used both as an oven and as a microwave. Moreover, if you wish, you can combine conventional heating with a microwave, which allows you to significantly reduce the cooking time. 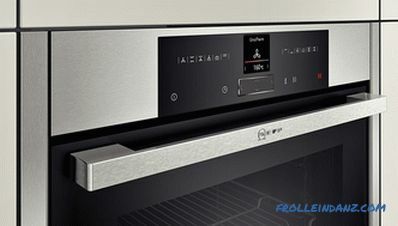 The automatic programs built into the memory of an oven with electronic control can significantly simplify the process of cooking various dishes. The user only needs to specify the type of product (meat, fish, vegetables, etc. ), select one of the types of dishes offered to him to choose from which this product can be prepared, enter the weight of the product. Then the oven acts on its own: focusing on the algorithms embedded in its memory, it selects the temperature regime and determines the process time, and after some time you get a ready-made lunch. The number of pre-installed automatic programs varies from model to model, but can reach several dozen. 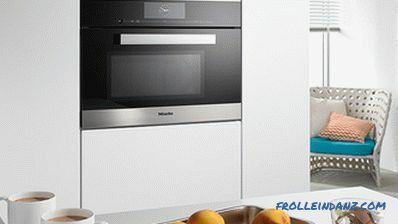 Some modern premium ovens allow the user to update the software by downloading new auto programs in addition to the existing ones, as well as save their own cooking algorithms. If you often bake whole carcasses of poultry or large pieces of meat as the main dish of a festive dinner, you will need a spit. 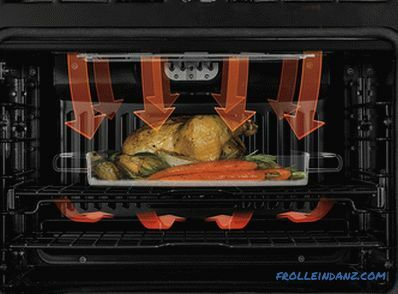 The spit rotating from the electric drive specially designed for it will help to evenly warm the product, to make your signature dish even more tasty and attractive. 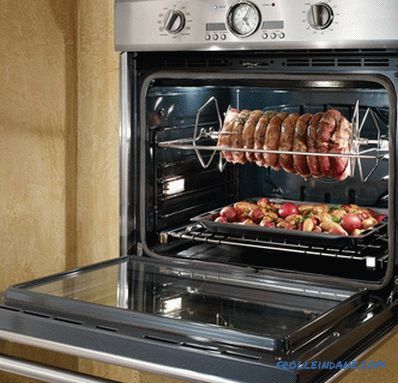 However, if there is a convection heating mode in your oven, then you can refuse the grill.The fan will perfectly cope with its function: in this case, the products will not rotate in hot air, but hot air around the products - the effect will be the same, which means that the meat on the grill will be prepared as well as on a spit. When baking large pieces of meat, it is difficult to estimate how much the temperature inside the piece differs from the air temperature in the working chamber, and consequently, to make an assumption about the degree of product availability. You will come to the aid of thermoprobe - a thermometer that measures the temperature inside the prepared product. When the required temperature is reached, the probe will “inform” the control system of this, and the probe will in turn notify the user or auto-shutdown. The doors of most ovens open in the traditional way, leaning forward. This is not always convenient (especially in small kitchens), but we are all so used to it that we can’t imagine otherwise. However, other options also exist. If the oven is installed not under the hob, but at the user's chest level, then a model with a hinged door that opens to the left or to the right is more suitable. There are also ovens with sliding doors: in this case, the trays are fixed on the door and come forward with it. Thanks to this design, you do not have to stick your hands in a hot oven. All cooking dishes can be rolled out and well considered. A few words should be said about glazing. Most ovens have double glazed doors. However, the more glasses, the better the insulation of the oven, which means that the cooking time decreases, and the risk of getting burned by accidentally touching the external glass. Therefore, today it is quite often possible to meet models with three- and even four-chamber double-glazed windows. The standard equipment for an oven usually includes a frying pan and a baking tray and two or three metal trays. 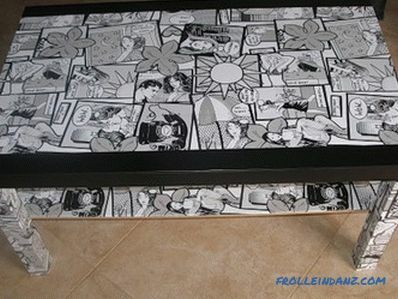 Baking sheets can have a usual enameled or non-stick coating, be the same or different depths. Some ovens have a glass tray, a stone for baking bread, and more. 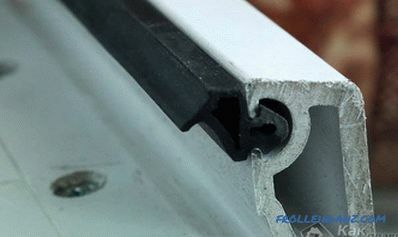 In addition to metal trays, telescopic guides for them may also be supplied. 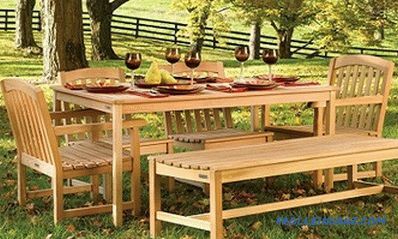 The use of telescopic rails simplifies the removal of trays, since they very easily move along special rails. Telescopic guides can be made under one or more trays. The ideal option for you would be if the manufacturer offers to buy such additional accessories separately, and not bundled with an oven - not a fact that you will need all of them, and in this case it is not expedient to pay for them. The maximum temperature that it can reach directly depends on the power of the electric heater. For example, an oven with a capacity of 3. 5 kW can warm up to 500 ° C. Such a temperature may be needed only if the pyrolytic cleaning method is provided in this oven, but for cooking this temperature is clearly excessive - any products at 500 ° C will simply turn into charcoal. From this it follows that the power of 2-3 kW for the average oven is enough. The power of most of the produced ovens falls precisely in this range, but you can find more and less powerful models (from 1 to 4 kW). Talking about the relationship between power consumption and heating temperature is unthinkable without mentioning such a concept as energy efficiency. Modern ovens have high energy efficiency - at least A or B, and more often even A +, A ++, A +++. The higher the energy efficiency of the oven, the more expensive it is, but less power consumption during its operation and, accordingly, your utility bills. For safe operation of the oven, it is required that it be cold outside when it is hot inside. This will save you from burns if you accidentally touch the red-hot door, the oven's electronics from failure, and the furniture in the immediate vicinity from damage or fire due to overheating. For these purposes, serves a special fan, which begins to work when any heating element is turned on. 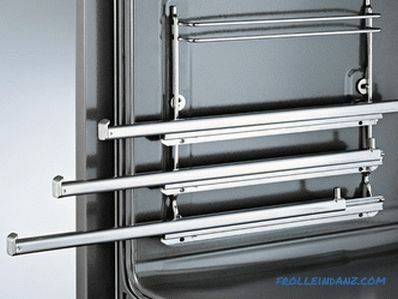 This fan draws cold air under the lower part of the oven, drives it through the cavities along the outer walls and pushes the already hot stream through the special holes above the door. As a result, an air barrier is created around the oven to prevent overheating of the external circuit and the formation of condensate.This technology, called tangential cooling, is implemented in many modern ovens. It would seem that oven lighting is a function whose need should be obvious even to people who are not engaged in self-cooking, but for some reason some manufacturers forget about it. The need for visual control over the cooking process in the absence of illumination pushes housewives to more often open the oven door. This means an increase in heat loss and ... an increase in the probability of an accidental burn. 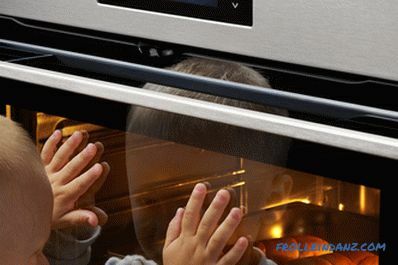 Parents of young children will be interested in the possibility of locking the oven door when turned on, as well as locking the control panel to protect against unauthorized change of mode. Far from all models can boast of such a function, so before choosing a built-in electric oven, ask about the presence of "child protection". For many, the design of the oven is just as important as its technical characteristics or functionality. This is not surprising, because the hostess spends a lot of time in the kitchen, and if the observed discrepancy between the styles of the equipment and furniture present there will cause her aesthetic discomfort, it will inevitably affect her mood and, as a result, the quality of the dishes she prepares. 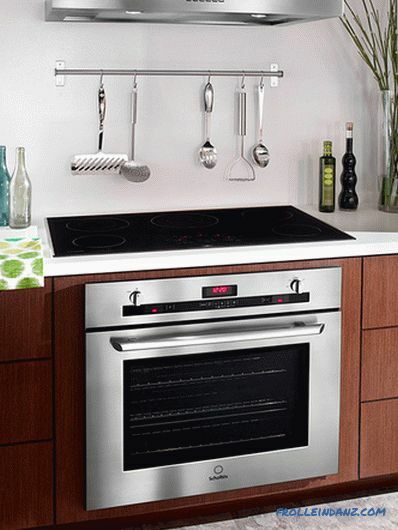 Today, ovens of the most diverse designs are on sale. If the classic black and metallic do not suit you, you can always choose a model of a different color, more relevant to your interior. Do not like the traditional high-tech? - there is a collection of technology in retro style. Manufacturers are trying to predict the wishes of customers, which means that whatever you want, sooner or later you will surely be found.